Our CAT 3 Telco assemblies feature a riser rated PVC 25 pair solid copper 24 AWG RoHS compliant cable meeting EIA/TIA standards for Category 3 and are equipped with a 50 Position 90 Degree Male champ connector on one end and a 50 position Female champ Connector on the other (also known as Amphenol connectors). We are the only vendor who offers a continuity test report included with each assembly to ensure performance. Category 3 cable, commonly known as Cat 3 or station wire, and less commonly known as VG or voice-grade (as, for example, in 100BaseVG), is an unshielded twisted pair (UTP) cable used in connecting multiple voice and/or data lines for LANs or telecommunications. This specific assembly can be used on patch panels, punch down boxes, distribution boxes, and icc’s 66 and 110 wiring blocks. Color code & Pin out 25 Pair AMP Connector, RJ21, Amphenol connector. RJ21 is a registered jack standard using a modular connector with contacts of up to 50 conductors. It is used to implement a 25-line (or less) telephone connection such as that used in the 1A2 key telephone system. 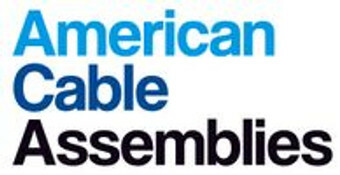 The miniature ribbon connector of this interface is also known as a 50-pin telco connector, CHAMP(AMP), or Amphenol connector, the latter being a genericized trademark, as Amphenol was a prominent manufacturer of these at one time. 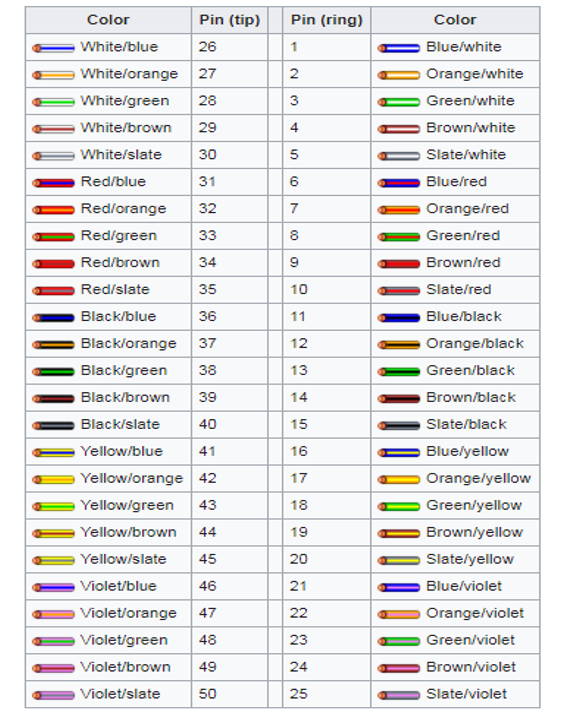 A cable color scheme, known as even-count color code, is determined for 25 pairs of conductors as follows: For each ring, the primary, more prominent color is chosen from the set blue, orange, green, brown, and slate, in that order, and the secondary, thinner stripe color from the set of white, red, black, yellow, and violet colors, in that order. The tip conductor color scheme uses the same colors as the matching ring but switches the thickness of the primary and secondary colored stripes. Since the sets are ordered, an orange (color 2 in its set) with a yellow (color 4) is the color scheme for the 4·5 + 2 − 5 = 17th pair of wires. If the yellow is the more prominent, thicker stripe, then the wire is a tip conductor connecting to the pin numbered 25 + the pair #, which is pin 42 in this case. Ring conductors connect to the same pin number as the pair number. A conventional enumeration of wire color pairs then begins blue (and white), orange (and white), green (and white) and brown (and white), which subsumes a color-coding convention used in cables of 4 or fewer pairs (8 wires or less) with 8P and 6P connectors. Dual Amphenol connectors are often used on punch blocks to make a breakout box for PBX and other key telephone systems. The same physical connector is used to connect Ethernet ports in bulk from a switch with 50-pin ports to a CAT-5 rated patch panel, or between two patch panels. A cable with a 50-pin connector on one end can support 6 fully wired 8P8C connectors or Ethernet ports on a patch panel with 1 spare pair. Alternatively, only the necessary pairs for 10/100 Ethernet can be wired allowing 12 Ethernet ports with a single spare pair. The same connector with spring bail locks is used for SCSI-1 connections. Some computer printers use a shorter 36-pin version known as a Centronics connector. (History info provided by - https://en.wikipedia.org/wiki/Registered_jack ) Note - Amphenol is a registered trademark of Amphenol corporation.